A lot of people had the same reaction about my upcoming visit to the Alamo. After a year in Texas, we decided to take our family to visit the famous shrine to the Texas Revolution in San Antonio. When we got there, even my children sensed what our native Texan friends had been telling us. I have visited many different battlefields from the Revolution and the Civil War, but the Alamo was different. Most battlefields are national parks that have preserved the tranquility and dignity of the historic sites. The fact that the Alamo was located just outside the town of Bexar in Mexican Tejas and, after Texas independence, the city of San Antonio grew up around it probably accounts for much of why the Alamo battlefield is different. When we arrived at the Alamo, we found that, unlike the Gettysburg battlefield, for instance, the Alamo was surrounded by a carnival atmosphere akin to that of a boardwalk. 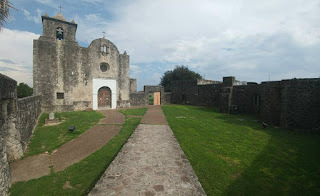 While the actual remnants of the Mission San Antonio de Valero, the old Spanish mission that became the Alamo fortress, were a solemn place, across the street was a Ripley’s Believe It Or Not Museum, The Amazing Mirror Maze and Louis Tussaud’s Waxworks. To us, the festive atmosphere seemed out of place on the site where hundreds of soldiers on both sides had died. A few years later, we made a brief detour through Goliad, the south Texas town most known to outsiders as the town that didn’t send reinforcements to the Alamo. Goliad is home to two old Spanish missions that have been restored. The two missions, Espíritu Santo at Goliad State Park and Presidio La Bahia just down the road, are much better representations of the history of the Texas revolution. In particular, the Presidio La Bahia, which has been completely restored, stands in contrast to the Alamo, most of which was destroyed in the battle. The building commonly referred to as the Alamo was the mission’s chapel, only one small part of entire complex. The Presidio La Bahia gives visitors a feel for what the Alamo would have been like in 1836. While there was no major battle at Goliad, La Bahia was the site of a lesser known massacre of Texas soldiers by the Mexican army. Shortly after the fall of the Alamo, Col. James Fannin’s men surrendered to the Mexicans and were imprisoned at Goliad. Santa Ana ordered the execution of the prisoners a short time later. More Texans were killed in the Goliad Massacre than at the Alamo. Their common grave and memorial is just outside the presidio walls. Today, Goliad State Park and the Presidio La Bahia, privately owned by the Catholic Diocese of Victoria, Texas, both provide good museums with that describe the area’s history in context and showcase period artifacts. La Bahia also features a short video that recounts the Texas Revolution. Whether you’re a Texan or visitor to the Lone Star State, if you are in San Antonio, by all means, visit the Alamo. From the bar of the historic Menger Hotel, where Teddy Roosevelt enlisted the Rough Riders, to the Riverwalk and Six Flags Fiesta Texas, San Antonio has a lot to offer as a vacation destination. But don’t be afraid to get off the beaten path. If you’re interested in the Texas Revolution, a side trip to Goliad may be even more enlightening and rewarding.